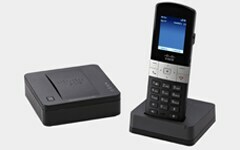 New Cisco SPA DECT Phones help small businesses improve agility with wireless and VoIP technology. Combine voice and data systems to get in touch and share information. Customers are quickly routed to the best resources. Learn how Cisco Voice and Conferencing solutions can make your business more competitive. Sign up for a free Cisco WebEx account today. Designed and priced for small business, you can now get data, voice, messaging, and wireless in one easy-to-use, complete package. Secure data, voice, video and wireless all come wrapped up in the Cisco Smart Business Communications System (SBCS) package. The Cisco Unified Communications 500 Series for Small Business is an easy to manage platform that is a critical part of SBCS. Communications platform designed for growing small to medium-sized businesses with smaller IT staffs. Use with Cisco gateway solutions to save on SIP trunking and leverage analog investments. Get full-featured, enterprise-class collaboration that is ideally sized and optimized for your growing midsize businesses. Not sure which voice system is right for you? A local reseller can help you decide. Get affordable and reliable basic IP and DECT phones, with support on Cisco Small Business and third-party hosted IP telephony systems. This IP phone portfolio is for advanced business needs; it is supported on Cisco Small Business, SIP open source, and hosted IP telephony systems. The Cisco Unified IP Phone portfolio offers the widest range of models, features, and price points; supported on Cisco Small Business systems. Not sure which phone is right for you? A local reseller can help you decide. Experience the quality of IP Telephony using analog and DECT devices. Extend your network more securely with Cisco gateways for SIP trunking and more. Various accessories for your IP phone system allow you to take wired phones wireless, and power devices without using electrical cables. Not sure which voice gateways and accessories are right for you? A local reseller can help you decide. Enjoy an affordable, reliable, and highly secure video collaboration experience from the WebEx cloud. See how video collaboration can help you make decisions faster and work better with colleagues, suppliers, partners, and customers. Meet with anyone, anywhere over the web—and work together as if you're in the room together. Deliver presentations. Share documents. Demonstrate applications. Even share control of your desktop to let someone else present. It's easy with Cisco WebEx Web Meetings. Try it free. Make video calls as easy as phone calls with Cisco Unified IP Phones 8900 and 9900 Series.